The British Government has revealed an initiative to equip the diminishing Red Squirrel population with arms, to aid them in their fight against the Grey Squirrels. The move comes after 25 Red Squirrel refuges have sought refuge in a large coniferous forest – a habitat disliked by the Grey Squirrels. The Government has declared that they believe that the Grey Squirrels are not just a threat to the Red Squirrels, but possibly the safety of the entire world and it is in British interests to help the Red Squirrels fight back. 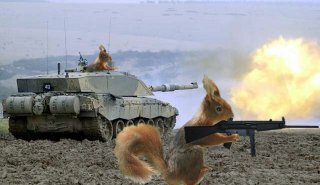 The Government has supplied the Red Squirrels with Tanks, Machine Guns and Ammunitions, as well as providing military training. The Grey Squirrel population is one of the most fundamentalist squirrel populations in the world, and are typically believed to hold strong anti Western views. Whilst the red squirrel population is also cynical where the west is concerned, the British Government hopes their more secular community will allow stronger diplomatic ties to develop in the future. Although the Grey Squirrel’s are currently dominating the Red/Grey conflict, the Red Squirrels are still in control of most of the nuts – one of the largest nut resources in the world – but the Government denies that nuts have anything to do with the conflict. The government insists that it has not made any trade deals concerning the exportation of nuts and that the Red Squirrels will have complete control of them as they are essential for securing their future economical development. Many diplomats are outraged at the British Government’s actions, claiming they are meddling in a very delicate situation. They also believe that if the Red Squirrels do triumph over the Grey Squirrels are likely to try and expand their army, possibly taking on the Badger community to the south of them, to try and get control of the Badger’s nuts. Given the strong alliance between the British and the Badgers this would mean that the British would be forced into defending the Badgers, meaning the British would be at war with an army they had just equipped. The Government has shaken off such notions as they believe they are far too ludicrous to transpire.